Saturday was a rough day. I worked essentially all day starting at about 8:00…and that was after just three hours or so of sleep. I somewhat volunteered to come in for a couple hours in the morning to complete a task that needed to be done here in Kalamazoo. After that, I headed home before our next event. J and I were going to take L to the Great Cloth Diaper Change at Small World Learning Village. As always, I figured we were heading to that side of town, so let’s find a restaurant over there we haven’t been to. 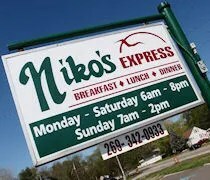 After a unusually lengthy Google search, I found Niko’s Express. It’s near the corner of Kings Highway and River Street in Comstock Township. 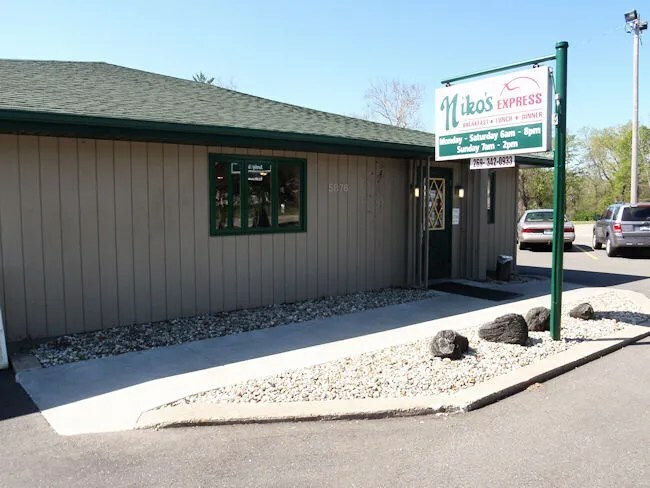 The little restaurant is in front of the Niko’s Landing Banquet Center and the two share a parking lot. Niko’s Express doesn’t really hold any surprises. There are two dining rooms separated by a partial wall. The space is filled with tables and booths packed in pretty tightly. The muted greens and browns and the specials written on a dry erase board make this feel like the corner family restaurant that it is. We didn’t see a hostess station when we walked in so we headed over to a corner booth. 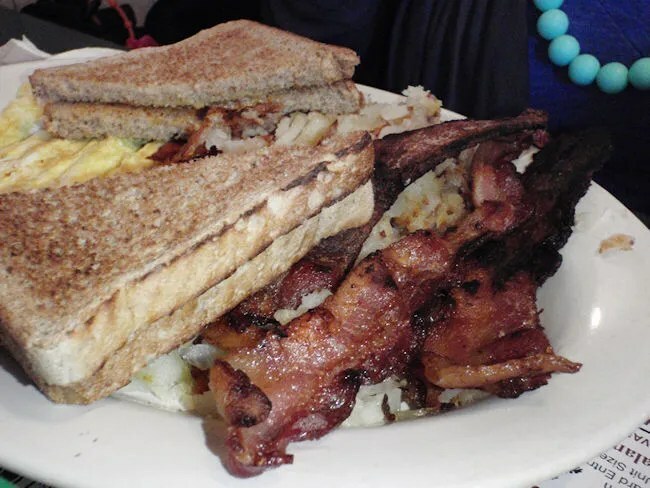 We showed up in that awkward time sort of between breakfast and lunch, but the breakfast menus were on the table and the specials boards hadn’t been changed yet either so we didn’t question it. I was incredibly happy to see Pepsi on the menu. I was having a really bad craving and the Speedway next door was taunting me with their 44 oz fountain drinks. It took longer than expected for our waitress to make it over to us. A few waitresses who didn’t have our table spotted L and wanted to play with her, but our waitress took a little longer. By the time she did get to us, we were ready to order when we put in our drink orders. I don’t remember the exact number (I think it was #5), but J ordered the breakfast plate that included eggs (scrambled), toast (wheat), American fries, and bacon. She asked for the bacon really well done. When it came out, the waitress asked to make sure it was ok because it was almost burnt, but that’s the way J likes it. She had to eat with L on her lap, but it didn’t seem to bother her. She seemed happy with her meal. I ordered my usual breakfast option. The Steak & Eggs (I think it was #21 on the men) was actually one of the specials that day. The plate is an 8oz. 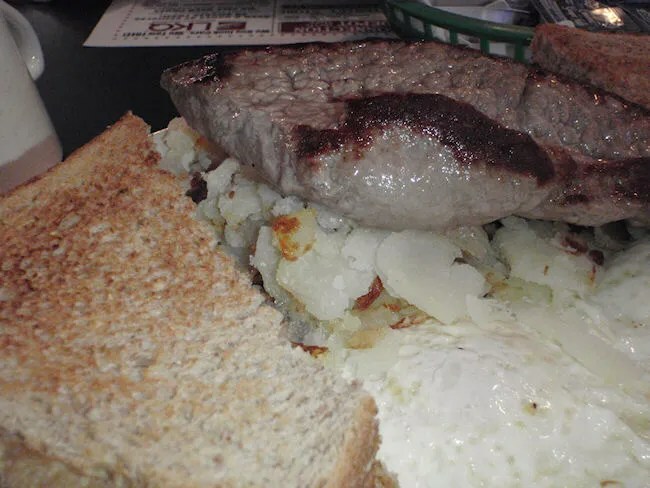 sizzler steak (medium rare), eggs (over medium), toast (wheat) and American fries. The steak really needed some kind of seasoning even if it was just salt and pepper. I did something I don’t usually do and opened up the A.1. There wasn’t much of a crust on it and it was just kind of blah. Not bad, but just needed a little something extra. Other than that, my breakfast was right on par with a greasy spoon diner. The eggs were just a little runny, the American fries had a great crusty layer, and the toast was crunchy yet still soft from the butter. L was starting to fuss a little as we were finishing up breakfast, so we asked for our check. J picked L up to take her to the car and left me to take care of the bill. I didn’t see a cash register right away, but the waitress didn’t grab my money when she handed me the check so I knew there had to be one. I asked J to look next to the door when she left. She said she didn’t see one, but it was the only place in the restaurant I couldn’t see. I got up and walked over there hoping it was there. Sure enough, it was really hidden behind a wall. I actually had to move out of the way so the cashier could make his way back there as it’s pretty tight.